...well, you can imagine the laundry, I suppose. Backed up, spilling out from the laundry closet in our upstairs hallway. Not pretty and pretty overwhelming. Sean is great but wasn't used to the all-day laundry routine I normally have going here. Seems like in between every daily activity was a run upstairs to rotate laundry, fold or put away. from a major retailers scratch and dent place, with warranties and (so smart that he is) they're ranked high by Consumer Reports. Not just a dryer, but a high efficiency washer too! I looked at the trailer he brought them home on, puzzled at two things on the back of it. 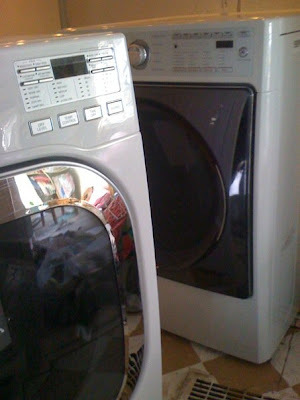 My sweet husband first apologized for buying me appliances (I was over the moon, happy!) then told me he didn't want me spending the best part of my days doing laundry (heart melt). They light up like space-ships and I've just mastered the basics but already I am down to doing two loads of laundry a day with sometimes a small third load (cloth diapering) in the middle of the day. Before I was typically doing 4-5 loads a day without diapers. Just thought I'd share my laundry blessings! What an awesome blessing! I am thrilled with my new machines and I am sure you are just enjoying these to bits! Yea for new appliances! I have only 1 10 month old at this point and I feel like all I do is laundry. But what I'd really like to know is what you use for cloth diapers? We just started cloth diapering. I am SO happy for you!!! But will admit, very jealous! I too would be over the top happy with a new washer and dryer. A girl can dream right? Thanks for sharing your laundry blessings. As a mother of 5, I can say I would be "over the moon" with that gift as well. Enjoy your appliances, I hope it frees up some more time for you to spend with your wonderful family. But I love gifts that make my life eaiser, enjoy your new "presents"! What a wonderful blessing, and what a thoughtful husband! I'm so glad that your laundry will be much easier now, and hope that you get many years of enjoyment out of your new washer and dryer! I am so happy for you. My dryer just went out. I have 4 children, so I can just imagine what your laundry load looks like. I love your blog. It's one of the few I come back to. God bless you. We have a HE washer, but an older dryer someone gave us. We've been contemplating about buying another pair on black friday. The HE ones are SO worth it, they fit so much more than others do! Sean sounds like such a blessing! We had to purchase a new washer & dryer set after my washer of 20 years gave out. The entire time we owned them we only had to replace the heating element on the dryer once & that was all. They were the Montgomery Ward brand, not even any brand name. My husband I believe that as tithers God will rebuke the devour & we include our appliances in our prayers :) He kept those two going for many years. I pray yours keep going for several years as well. Congratulations!! You have a very considerate husband! Oh, I just love your special blessing. Just make sure that this is one story that gets told over and over for years, to become a little "monument" of love from your honey to you. Your children will learn how to bless those they love. Being a rocks, "dirt" and lumber girl myself, I have many special stories that my boys heard growing up. Now, with their loves they think of buying the most *interesting* gifts. Congratulations on your new servants! What a wonderful blessing to You! I am so glad that you have a thoughtful and loving husband.